If you don't already have a high-performing 100-400mm lens in your kit, lend me your attention, because the Tamron 100-400mm f/4.5-6.3 Di VC USD Lens might be just want your kit needs. The 100-400mm telephoto focal length range is an extremely useful one and having that range in a compact, nicely-designed and well-performing lens that includes Vibration Control (VC), Ultrasonic Drive (USD) AF and weather sealing is an attractive proposition. Throw an affordable price tag into the equation and the option becomes an especially enticing one. 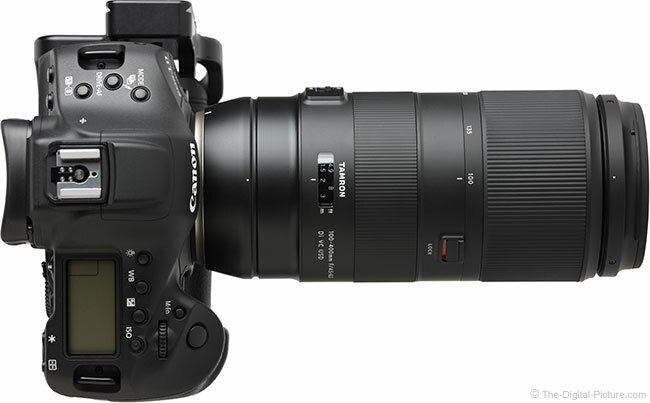 The Tamron 100-400mm f/4.5-6.3 Di VC USD Lens was announced roughly 7 months after the lens that most would regard as its closest competitor, the Sigma 100-400mm f/5-6.3 DG OS HSM Contemporary Lens. I'll provide some observations on how these two lenses, along with some premium-priced Canon, Sony, etc. options, compare at the end of this review, but for now, let's take a look at Tamron's entry into this market segment. Tamron has a lot of experience producing telephoto zoom lenses, so it's a bit surprising that this is their first featuring the common 100-400mm focal length range. Considering the success of Tamron's recent lens introductions, including the 85mm f/1.8 Di VC USD and 70-200mm f/2.8 Di VC USD G2 lenses, I was eager to find out if the Tamron 100-400mm f/4.5-6.3 Di VC USD Lens would continue the trend. Getting the right focal length range is a critical part of the lens selection process and once again, the focal length range made available by this lens is a compelling feature. This medium-to-long telephoto focal length range has a great number of uses and it is an ideal choice for general purpose telephoto needs. Wildlife photography is one of the best uses for the 100-400mm focal length range. It is typically not easy to get close to wild subjects that can run/hop/leap/crawl away (or may present a danger to you), but a 400mm focal length can aid in keeping subjects large in the frame while maintaining a comfortable (for you and/or the subject) distance. Even when carrying a longer focal length lens for wildlife photography, I frequently carry a second camera with a 100-400mm lens mounted because it is often the best option. Wildlife subjects ideally suited for capture with the 100-400mm range abound – they can often be found right in the backyard or at the other end of the earth. For most of us, a safari is toward the other end of the earth and this lens is a great option for that use. Closer to home are zoos and this lens is a great choice for the wildlife found here. 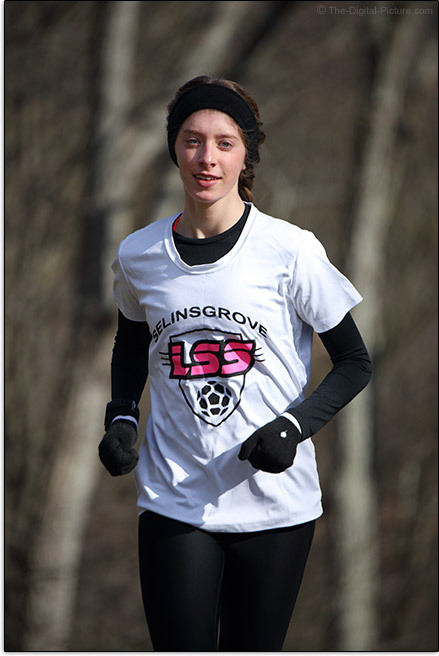 The 100-400mm range is great for portraiture. At 100mm, this lens provides ideal perspective for portraits ranging from head-and-shoulders to full-body as long as the working space allows. By 400mm, even very tightly-framed headshots retain great perspective. Parents chasing kids can also find plenty of uses for this entire focal length range including for their at-the-park and at-the-beach needs. Sports photographers can utilize this lens' entire focal length range, with the ability to track a continuously-properly-framed athlete from a distant position to a close one. I nearly always have a 100-400mm lens along when shooting large landscapes and some of my favorite landscape images have been captured within this range; this lens can make an even mediocre sunset appear amazing. Air show photography is a great use for the 100-400mm focal length range. Telephoto lenses are ideal for isolating details of many kinds. This list is far from inclusive, but hopefully gets you thinking about how you can apply this range to your own opportunities. Those using an ASP-C/1.6x FOVCF sensor format DSLR will see an angle of view similar to a full-frame-mounted 160-640mm lens. This shifted-narrower angle of view range moves the 100-400mm uses deeper into the sports and wildlife realms with bird photography and big-field sports being especially good options for the focal length range. Overall, the 4x zoom range is very nice. Match the provided focal length samples with the capabilities of your current lenses to better understand the focal length range to be gained. Creating a zoom lens with long focal lengths generally means a compromise between max aperture opening and size/weight/cost. Because aperture is measured as a ratio of lens opening to focal length and because this lens' maximum opening does not increase enough with focal length increase to maintain the same ratio, the max aperture is a variable one, ranging from f/4.5 to f/6.3 as the focal length range is traversed. The advantages of a narrow aperture, because the size of the lens elements can be reduced significantly, include lighter weight and lower cost. Those are two things that we all can appreciate. The variable max aperture has the same two advantages, compounding the benefit. A downside to the variable max aperture is that, by definition, the same max aperture cannot be used over the entire focal length range. Your camera will automatically account for the change in auto exposure modes, but making use of the widest-available aperture in manual exposure mode is complicated somewhat. It is normal for long focal length zoom lenses to have a variable max aperture. Here is a comparison showing the max aperture step down for some comparable telephoto zoom lenses. 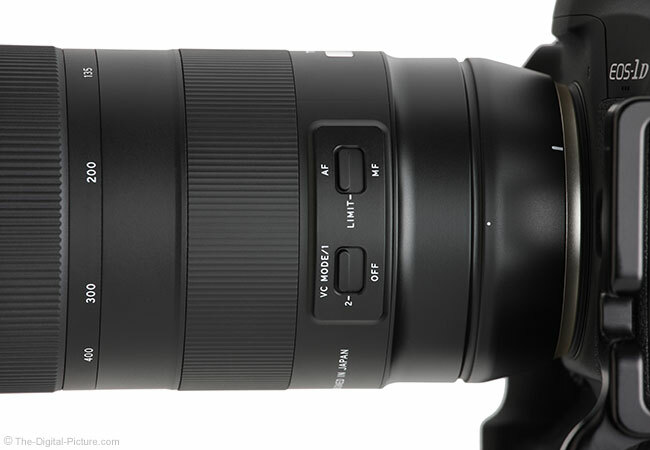 If you are interested in a lens missing from this list, head over to the full Tamron 100-400mm f/4.5-6.3 Di VC USD Lens specs using the site's Lens Spec Comparison Tool that enables far more comparisons. This lens has an f/4.5 max aperture and that gives it an advantage over some of the other lenses included in this chart, most notably the Sigma 100-400. Note that f/4.5 is only available for the first 37mm of the focal length range, from 100mm through 136mm. That is enough to count and that is enough to give you f/4.5 in those cases where you must have it. Most of the differences shown in the above table are 1/3 and 2/3 of a stop. While a 1/3 stop difference will not be a differentiator to most photographers, 2/3 of a stop begins to appear more advantageous. Still, consider how much of the range has a 2/3 stop advantage in comparison before using this attribute as a deciding factor. The bottom line is that this lens has a relatively narrow aperture at the widest focal length and by 181mm, it has the narrowest max aperture found with any frequency in any modern lens. In fact, it is 1/3 stop narrower than many cameras technically require for autofocus to function (f/5.6). Apparently there is some leniency in this spec as, fortunately, the Tamron 100-400 VC's autofocus will work with these cameras. The Tamron 100-400 is not an ideal lens for stopping action in low light. When the sun goes down, action sports photographers using this lens (or similar models) will be reaching for very high ISO settings to keep images bright enough while keeping shutter speeds short enough to freeze their subjects' motion. This lens is not a good choice for indoor sports. On many cameras, the sharpness-reducing effects of diffraction kick in with some strength at f/11 through f/16 (depending on the DSLR being used), so there is a somewhat narrow range of sharpest apertures remaining for use. Fortunately, those remaining apertures are quite useful and I find myself most frequently using the wide open apertures on telephoto lenses. While wide apertures are better for creating a background blur, long focal lengths also have this ability and using those, this lens can create a very strong background blur. Move in close to the subject with a distant background, zoom to 400mm and watch the background melt away. The relatively close (30'/10m?) subject in the example above was captured at 400mm f/6.3. I doubt that you can recognize the ornamental grass plumes photographed here. The combination of relatively narrow apertures and long focal lengths mean that bright daylight and/or high ISO settings are required for handholding – unless image stabilization is utilized. Thankfully, Tamron's VC (Vibration Compensation) greatly extends the versatility of this lens, potentially improving image quality significantly by eliminating camera shake-induced motion blur. When you need to leave the tripod behind, VC is there for you, helping to ensure sharp images. A great feature of vibration compensation is a stabilized viewfinder, aiding in optimal composition which is also an image quality factor. Similarly, VC can stabilize video recording for a much more pleasant-to-watch result. An image stabilization benefit often overlooked is its assistance in AF precision. The camera's AF system can produce better focus precision if the image it sees is stabilized and Canon contends that this is true even with a subject that is in motion and at action-stopping shutter speeds. The Tamron 100-400 includes two VC modes. 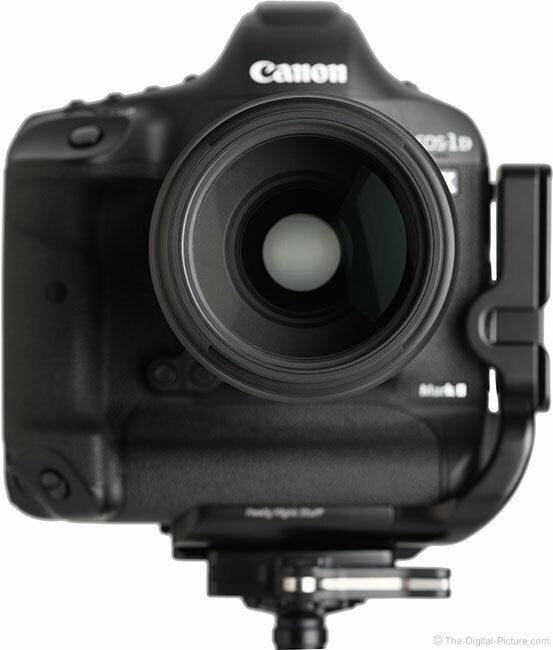 Mode 1 is designed for normal handheld photography, stabilizing the image on two axis. Mode 2 is designed for panning with a moving subject with one axis of stabilization provided. At 100mm, using an EOS 5Ds R, I have a decent sharp image rate to about 1/13-1/10 second exposures with a low hit rate experienced at longer exposures. At 400mm, the decent hit rate stops at about 1/50 with a much lower hit rate experienced at longer exposures. Keep in mind that Tamron's rating was derived using a much lower resolution EOS 5D Mark III. This VC implementation is very quiet with a light clicking/whirring being audible while activated. VC activation sometimes causes the viewfinder image to jump, but the final result is a very noticeably stabilized image in the viewfinder. Slightly frustrating is this VC implementation's propensity to drift the image if the lens is held still (not usual for this class of lens) and more frustrating is that the framing jumps slightly during framing adjustment. These attributes are especially noticeable at 400mm. With the optional accessory Tamron TAP-in Console (more about this later), the configuration of VC can be customized. Options include Standard (default, balanced, tested), Viewfinder image-stabilization priority (stabilization of viewfinder image is prioritized) or Capturing image-stabilization (stabilization of captured photograph is prioritized). The jumpiness seen in the viewfinder increases when Capturing image-stabilization is selected and that aspect is modestly reduced in Viewfinder image-stabilization priority. Per Tamron, VC should be turned off when the camera is not being handheld. For many applications, image quality is the paramount lens selection criteria and of course, I'm always anxious to put a lens to this test. Some of the recently-introduced Tamron lenses performing so well (such as the Tamron 70-200mm f/2.8 Di VC USD G2 Lens) only serves to pique that interest. And, the Sigma 100-400mm f/5-6.3 DG OS HSM C Lens hitting the streets and setting the bar high prior to the Tamron 100-400 VC even being announced was an additional excitement factor (they knew where the bar had been set to). 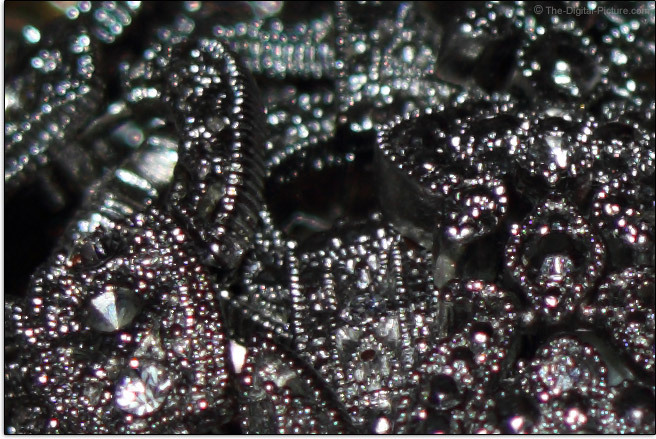 With the lab Image quality test results loaded on the site, the picture becomes clear. Or, in this case, clearer, at least. Of importance is a short discussion of the corner performance equivalency of this lens copy. As long as the lens elements are properly constructed/dimensioned, a properly-aligned lens will deliver equal image quality in each corner. The Tamron 100-400 we tested modestly favors the left side at the wider half of the focal length range. That of course places it at a disadvantage in the site's image quality tool as the right corners show there. As the focal length increases, the difference resolves. Because the Sigma 100-400 is currently this lens' closest competitor, I added that lens' wide open 100mm sample to the bottom of the comparison. 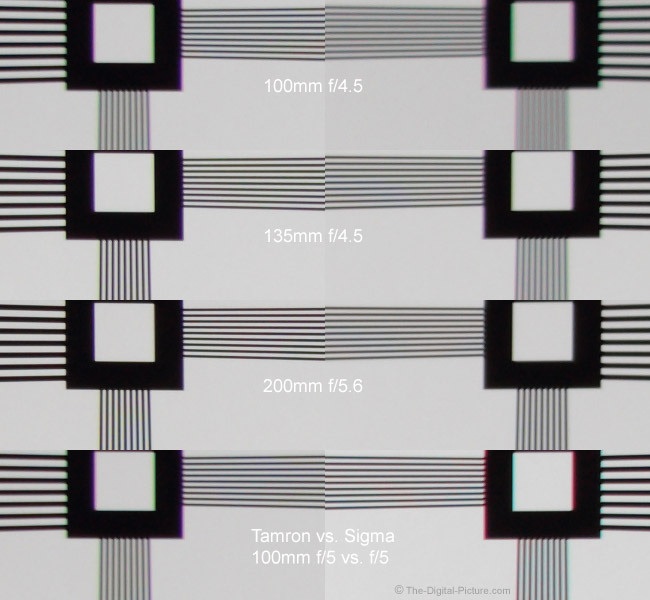 While the Sigma crop appears slightly sharper than the Tamron crop, I doubt that most will find the corner sharpness difference to be of significance in the overall comparison. Most of our review lenses, including this one, are off-the-shelf retail models and your chances of getting a slightly misaligned one are as good as ours. This defect can happen, but ... no one is happy when they learn that their lens has an issue, however small. And, it costs us a lot of time to minimally explain what is happening and to, ideally, re-test another lens. We'll attempt to find time to test another copy of this lens, but for now, visualize the above differences when viewing the chart results. I'll use the stronger-performing left side for the image quality description. Starting at 100mm with a wide open f/4.5 aperture, the Tamron delivers very good sharpness in the center of the frame with sharpness deteriorating just slightly into the full frame corners. Stop down the aperture by 2/3 of a stop to f/5.6 and the entire frame becomes very slightly sharper. At f/8, this lens is delivering crisp sharpness from full frame corner to corner. At 135mm f/4.5, this lens is tack sharp across the entire full frame image circle. At this focal length, less improvement is seen at f/5.6, but little is needed. Similarly, the f/8 results show little improvement, appearing similarly nice as the f/5.6 results. 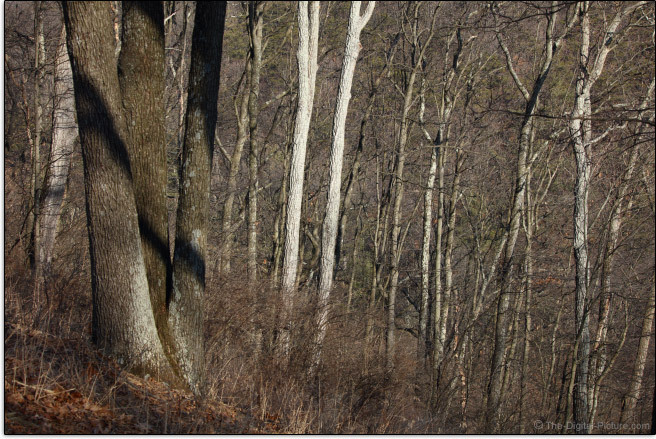 At 200mm f/5.6 (wide open for this focal length), the results look like 135mm f/5.6 – very sharp across the frame. The f/5.6 results are so sharp that stopping down doesn't bring any improvement in that regard. Once again, at 300mm, wide open results (now f/6.3) are great and improvements are hard to spot at f/8. Of course, f/8 is only 2/3 of a stop narrower than f/6.3 and at f/8, diffraction is already playing a role in softening the results from the ultra-high resolution EOS 5Ds R test camera. At 400mm f/6.3, center of the frame sharpness takes a slight hit and the corners take a modestly bigger one. Stopping down generates only a slight improvement in the 400mm results. As you will see below, the 400mm corners are not bad, just not ideal. In addition to our standard lab tests, I like to share some real world examples. The images below are 100% resolution crops captured on a clear day in RAW format using a Canon EOS 5Ds R. These images were processed in Canon's DPP (Digital Photo Professional) using the Standard Picture Style with sharpness set to "1". The first examples are from the center of the frame. While the prior image sharpness description still applies, testing telephoto lenses outdoors under a clear sky means that heat waves inevitably impact the results at least slightly. In the end, I wasn't satisfied with the 400mm f/8 results and instead opted to share five f/6.3 crops with the third one captured indoors (though still in direct sunlight) and the last two captured handheld. As you look at the aperture comparisons within a focal length, you may notice a slight focus shift toward the back as the aperture narrows. I am usually finding that the subject remains in sharp focus despite this slight behavior. Again, the results appear to meet the description. Note that, even though they were captured just as the sky cleared after a snow storm, the 400mm results may again be showing some slight air density issues. Does corner sharpness matter on a telephoto lens? While typical use of long focal length lenses involves out of focus corners, that is not always the case. Landscape photographers often want the entire frame in focus and photographs of any flat subject may need sharp corners. I'll talk about the primary cause of the less-than-perfect corner results soon, but one corner difference created by stopping down is reduction of vignetting. However, the amount of vignetting exhibited by this lens is not especially strong. With a wide open aperture, expect just over 2 stops of shading in 100mm corners and about 1.5 stops of shading in longer focal length corners. Stop the lens down to f/5.6 and 100mm delivers a similar amount of shading as the longer focal lengths do at the same/similar aperture. At f/8, approximately .8 stops of shading remains in the wide and long corners and about .5 stops shows in the mid focal length range. Amounts around 1-stop remain just-visible in certain situations, such as a clear blue sky, so at f/8, little concern remains. Want negligible peripheral shading in even clear skies? At f/11, a rarely-noticeable .2 stops remains over the entire focal length range. Overall, this lens performs well in this regard. Those using APS-C sensor cameras will not likely notice vignetting effects at any focal lengths and aperture combination. 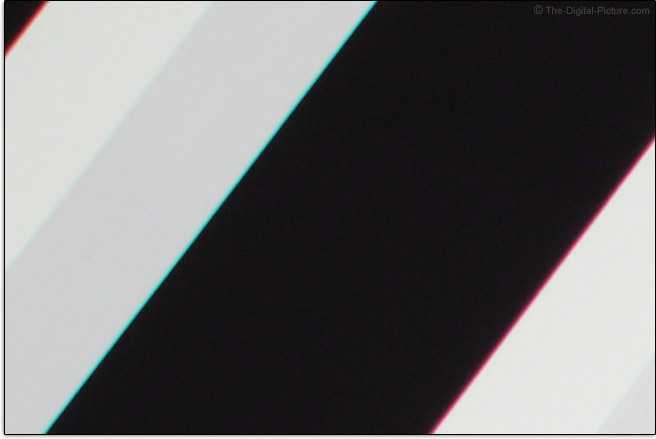 The most-easily noticed type of CA (Chromatic Aberration) is lateral (or transverse) CA and this shows as different colors of the spectrum being magnified differently with the mid and especially the periphery of the image circle showing color fringing along lines of strong contrast running tangential (meridional, right angles to radii) as this is where the greatest difference in the magnification of wavelengths exists. If it is a zoom lens, lateral CA is probably present. This lens has some and the corner image sharpness results shared above are being negatively influenced by lateral CA. 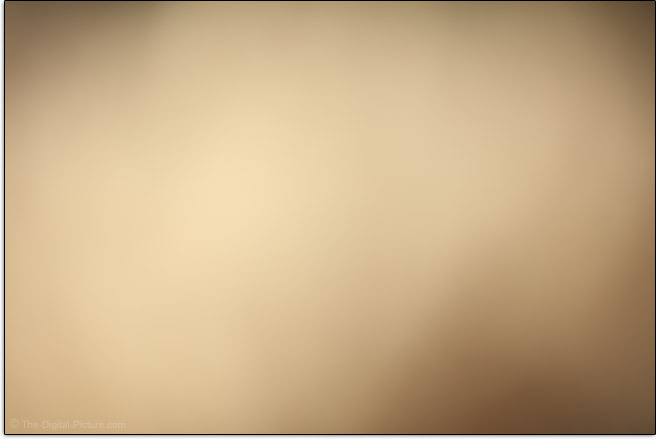 This color misalignment can easily be seen in the site's image quality tool and in the corner crops shared above, but let's also look at a set of worst-case examples, 100% crops from the extreme top left corner of ultra-high resolution 5Ds R frames. There should be only black and white colors in these images and the additional colors illustrate lateral CA. 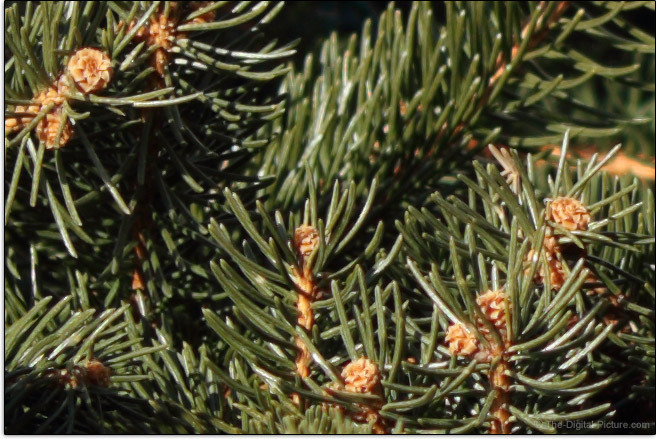 At 100mm, there is modest color misalignment. Lateral CA diminishes until it becomes negligible at 200mm before becoming modestly noticeable again at 400mm. Fortunately, lateral CA is easily software corrected by radially shifting the colors to coincide. Unfortunately, other-brand camera manufacturers do not make Tamron lens correction profiles available for their cameras and that means lateral CA correction is only available during post processing. 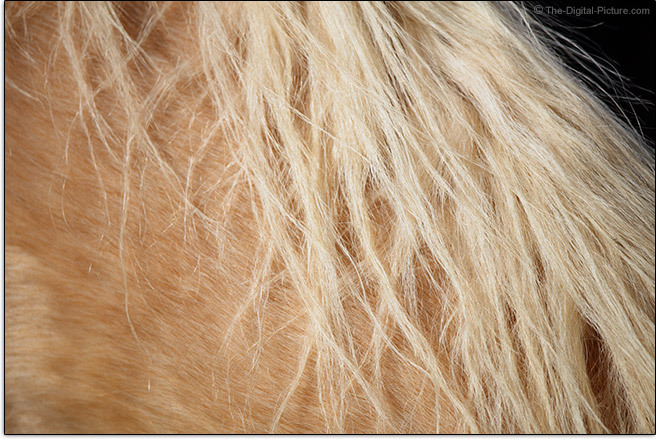 The 100% crop examples below show neutral-colored subjects. Look for color differences in the foreground and background blur present in each of these images. The axial CA seen at 100mm is not too bad, but there is some. The effect lessens at 200mm and by 400mm, any color fringing is hard to discern. "Two highly developed lens coating technologies, eBAND (Extended Bandwidth & Angular-Dependency), which uses nanotechnology, and BBAR (Broad-Band Anti-Reflection) combine to increase light transmission and to reduce flare and ghosting to imperceptible levels." [Tamron] Put the sun in the corner of a telephoto lens and you should expect to see some flare effects in your images. The amount of flare shown by this lens, especially in regards to long telephoto focal lengths and a relatively high lens element count, is normal. If a zoom lens is going to break the tradition of having barrel distortion at the wide end and pincushion distortion at the long end, it is probably a telephoto zoom and this one indeed strays from the norm. The Tamron 100-400mm VC Lens has very slight pincushion distortion at 100mm. The pincushion distortion increases very slowly as the focal length is increased, but slowly enough that it remains only modest at 400mm. Most modern lenses have lens correction profiles available for the popular image processing applications and distortion can be easily removed using these, but distortion correction is destructive at the pixel level and this technique is seldom as good as using a distortion-free lens in the first place. The rounded 9-blade aperture, aided by a relatively narrow max aperture, creates nicely-rounded specular highlights. You may have noticed the foreground blur appearing a bit harsh compared to the background blur in the 400mm axial CA test crop above. Significantly stronger concentric rings are present in the foreground specular highlights while the background ones have a smoother appearance. 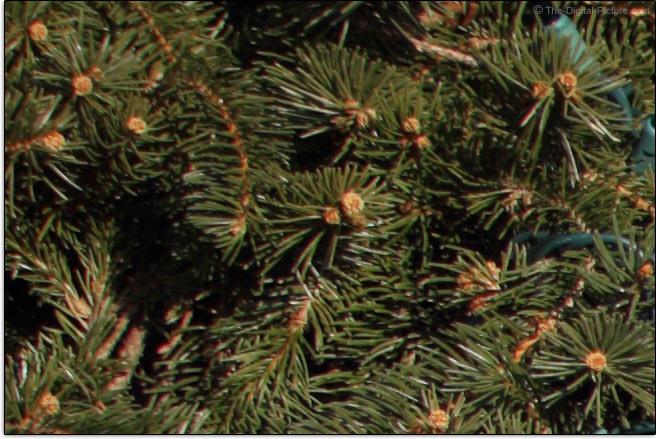 The results appear similar over the entire focal length range, but the first two examples shown here were captured at 200mm. 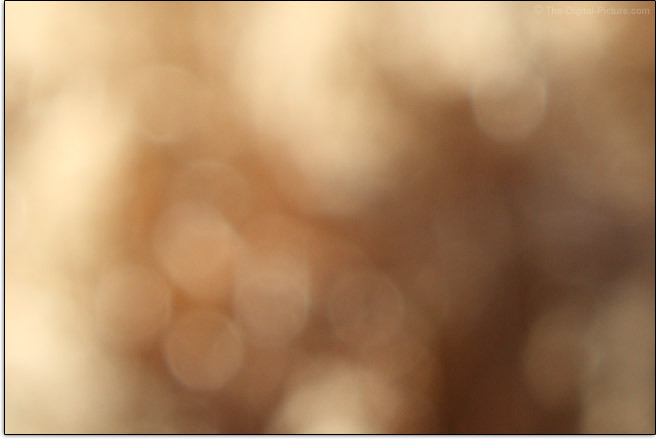 The last two results additionally illustrate the out of focus image quality of this lens, which appears very nice. Wide aperture lenses are typically advantaged in their ability to create these star effects, but obviously this lens can still create them. Overall, this lens is turning in very good image quality. The slight misalignment of the review lens might annoy perfectionists, but even this specific lens is quite impressive for its price point. Regarding the Tamron 100-400mm f/4.5-6.3 Di VC USD Lens' autofocus system, Tamron shares: "A built-in DSP (Digital Signal Processor) on the MPU delivers highspeed processing of digital signals, while ensuring excellent AF responsiveness. This improvement allows you to track subjects moving at high speeds, even more accurately. The AF drive system also uses a USD (Ultrasonic Silent Drive) motor for outstanding performance and fast, precise focusing." Tamron's Ultrasonic Silent Drive is very nice. This implementation of USD is quiet in operation, with only a light "shhhh" heard in quiet environments. The focus speed is quite fast and seldom are fine-tuning adjustments noticeable after the initial focusing. One of the lens aspects I always test thoroughly is autofocus accuracy with consistency being especially important as consistency can be calibrated into accuracy if necessary. And, I have historically dread testing 3rd party lens AF accuracy because ... many of these lenses have performed poorly in this regard. It is highly frustrating to spend weeks evaluating a lens only to have the AF results reveal a flaw large enough to make people no longer interested in it. This lens has great sharpness, but that sharpness can only be realized if the lens is focused accurately and most of us rely on AF for that task. The good news: this lens has been consistently focusing accurately for me, turning in a high percentage of properly focused images. I often notice peripheral AF points not performing as well as the center AF point when using third party lenses, but this lens performed nearly as well using peripheral AF points as it did with the center one. In AI Servo mode, with the camera tracking the subject and predicting the focus distance at precisely the time the shutter opens, both performance and testing are challenged. There are seemingly millions of factors that can affect this performance, but aside from an occasional pause in the 1D X Mark II's frame rate (I have focus priority selected), out of nearly 700 test results, a solid percentage were in focus. Overall, I'm pleased with the Tamron 100-400mm f/4.5-6.3 Di VC USD Lens' AF performance. This lens focuses internally and FTM (Full Time Manual) focusing is supported. The AF/MF switch is a 3-position type and includes a mid-position called "LIMIT". The focus limit switch provides a restricted range of focus distances for potentially faster focus acquisition. If needs are expected to fall within one of the limited ranges, using the limit setting can improve AF speed with reduced hunting caused by extreme out of focus conditions. Depending on the lens' current focus distance setting, the limited range is between either 5' and 23'(1.5m - 7m) or 23'(7m) and ∞. Just to clarify, which limited range is selected depends on which range the current focus distance setting of the lens falls within. I like that. Using Tamron's Tap-In console (more later), the limited focus distance switch position can be customized to your choice of focus distance ranges. Tamron 100-400 VC lens subjects remain a similar size throughout a full focus extent change. Photographers using focus stacking techniques, videographers pulling focus and anyone very-critically framing a scene will appreciate this lack of focus breathing. Focus distance settings in ft and m are displayed inside a small window and available at a glance. Non-cinema lenses are generally not parfocal and that attribute can be individual lens-specific, but the review lens is definitely not parfocal. Plan on refocusing after a focal length change. The manual focus ring is nicely-sized (1.07"/27.1mm) and very smooth with ideal dampening. The focus ring being positioned to the rear of the zoom ring is not my preferred design, but this design is typical of 100-400mm lenses. The ribbed-rubber focus ring surface is nearly flush with the lens barrel and while I like this design, the ring is not easy to find with gloves on. Consequently, however, this ring stays out of the way. The provided 130° of focus ring rotation is ideal for precision work at 100mm, though I find adjustments happening too quickly at 400mm. This lens' 0.28x maximum magnification spec, achieved at 400mm at the 59.1" (1500mm) minimum focus distance, is a nice asset of this lens. While this number is not best-in-class, it is among the best-available in zoom lenses and it is very useful. Here is a comparison table showing the minimum focus distance and maximum magnification specs for similar-class lenses. Magnification can be modestly increased with the use of extension tubes, which are basically as their name implies, hollow tubes (with electronic connections) that shift a lens farther from the camera. Doing so allows the lens to focus at closer distances, though at the expense of long distance focusing. The Tamron 100-400mm f/4.5-6.3 Di VC USD Lens is compatible with Tamron's 1.4x Teleconverter (TC-X14) and 2.0x Teleconverter (TC-X20). Retaining the lens' native focus distance range, these options offer far greater magnification impact than extension tubes. Here is what these accessories look like mounted. The 1.4x teleconverter creates a 140-560mm VC lens, a focal length range that closely matches many of the other zoom lens options shown in the above table. Not so closely matching is the 1-stop-narrower max aperture this teleconverter creates, making this a dark f/7.1-9 lens. As mentioned earlier, many cameras require an f/5.6 max aperture for conventional phase detection AF to work and the best require f/8. Adding a teleconverter can negatively impact AF performance. At the wider focal lengths (note that these become less important when a teleconverter is required in the first place), this lens focuses quite fast with little or no hunting in reasonable light levels. Shift the lens out to 400mm and most AF attempts result in failure to focus on the f/8-compatible EOS 5Ds R I tested with. Live View and other sensor-based AF systems can typically AF with lenses as dark as f/11, so that option remains available. The viewfinder is not terribly bright with an f/6.3 max aperture and it will darken modestly with the 1.4x in place. When the base image quality of a lens is magnified, defects are also magnified and image sharpness at 560mm takes a modest hit. The 1.4x adds some barrel distortion, offsetting some of the lens' native pincushion distortion for a net-positive result for this aspect. That lateral CA is noticeably increased is a negative aspect. Addition of the 2x teleconverter makes this a very impressive 200-800mm VC lens. Much less impressive is the resulting f/10-13 max aperture and equally unimpressive is the sharpness of this combination that starts out diffraction limited at the wide open aperture on many current and recent camera models. Lateral CA remains increased over the bare lens at 400mm, but it does not appear increased over the 560mm combination. By adding a modest amount of barrel distortion, the 2x teleconverter addition creates a slight barrel distortion profile even at 400mm. Live View AF (at least on my 5Ds R) works even at 800mm f/13, but the performance is very slow and the scene needs to be pre-focused at least somewhat. My advice is to plan to use the 1.4x only in limited circumstances and leave the 2x at home. If focal lengths over 400mm are needed with any frequency, get the Tamron 150-600mm f/5-6.3 Di VC USD G2 Lens instead. While it is not a "G2" lens, the Tamron 100-400mm f/4.5-6.3 Di VC USD Lens gets a design similar to these lenses and that is a positive aspect. From the streamlined shape to the tight-fitting construction, from the multiple shades of matte black finish to the modern font used for the markings, this lens' clean design looks great and feels just as nice. All lenses in this class extend a significant amount by the time their longest focal length is reached, 2.74" (69.6mm) in this case. While a fixed-size lens is always nice, the extending design allows for far more compact retracted storage and carry. Even fully extended, there is no play in the barrel and only a slight amount of flex can be induced under pressure. The zoom ring is large in size (2"/52mm), smooth-functioning and positioned toward the front of the lens, well forward of the lens' balance point. While this is not ideal for fast zooming during use as the camera hand must assume some of the weight bearing task while doing so, this is normal for this class of lens. The zoom ring's rate of adjustment is ideal. The zoom ring rotates in the Nikon and Sony standard direction, opposite of the Canon standard and Canon shooters will need to acclimate to this directional change as it is not natural for us to go the other direction. However, the focus ring rotates in the Canon standard direction, insuring that users from all camps share in the acclimation process. This lens' VC and AF/MF switches are very nicely designed, residing on a shallow-raised panel in the typical location. Note that both of these switches are 3-position types. While adding the center position complicates setting selection slightly, these work fine with crisp haptic feedback. Also helping is that the middle position is typically the least-commonly-used, meaning that the switch will most often be pushed until it moves no farther and that is easy even with gloves on. A third switch is provided on the other side of the lens, permitting the lens to be locked into the retracted position. While the lens I evaluated does not gravity zoom and I didn't need the switch, if it should ever loosen in long-term use, that switch could take on value. The 100-400mm focal length range directly translates into a substantial overall size and weight, though size and weight are relative. 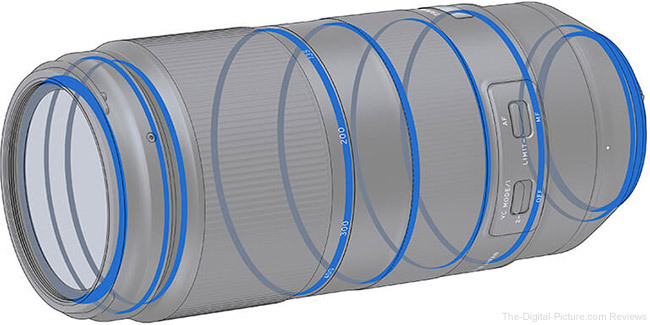 This lens is substantial relative to normal zoom lenses, but small and light compared to the 150-600mm zoom and large 500mm and 600mm prime lens counterparts. Thanks in part to a primarily-magnesium inner barrel construction and an engineering plastic exterior, the Tamron 100-400 hits the street as the lightest 100-400mm lens option. But, this lens is only very slightly lighter than the Sigma counterpart and it is, by a small margin, the longest of the similar options. For many more comparisons, review the complete Tamron 100-400mm f/4.5-6.3 Di VC USD Lens Specifications using the site's Lens Spec tool. 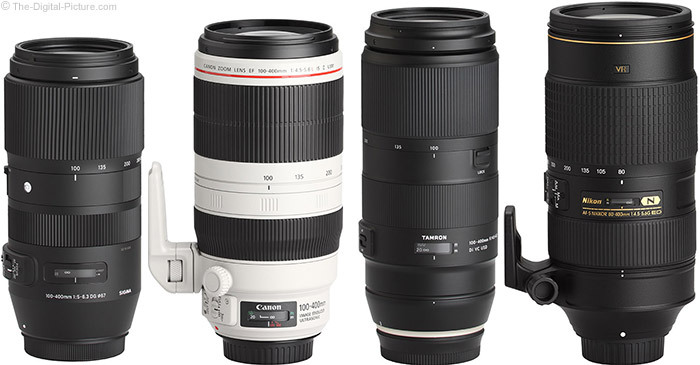 Use the site's product image comparison tool to visually compare the Tamron 100-400mm f/4.5-6.3 Di VC USD Lens to other lenses. While 100-400mm lenses are somewhat large, the Tamron 100-400 uses comparatively small 67mm filters. While the 67mm size is somewhat common, it is not the most so. But, the lower price and potentially smaller storage footprint make up for that issue. 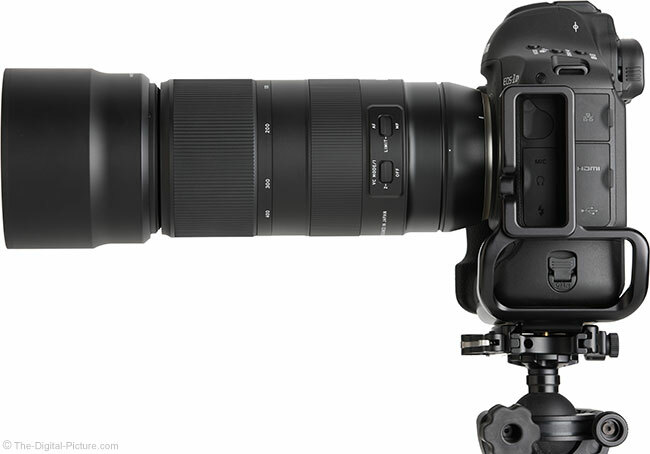 Sigma broke tradition by not including a tripod ring with their 100-400mm Contemporary lens and I mentioned the reduced tripod and monopod experience because of the full lens weight being cantilevered over the front of the camera. 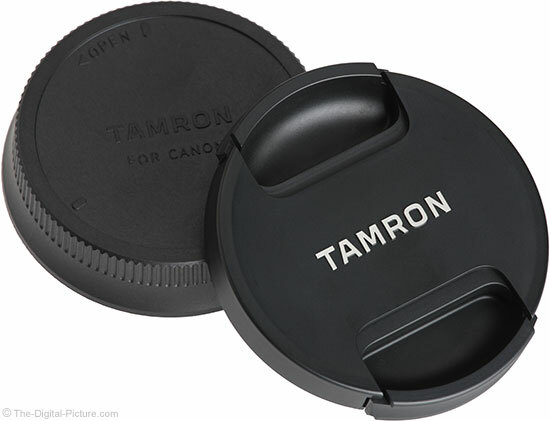 Tamron similarly ensures that the tripod mount ring's cost (and weight) do not negatively influence the purchase of this lens and it has the same issue when tripod-mounted. 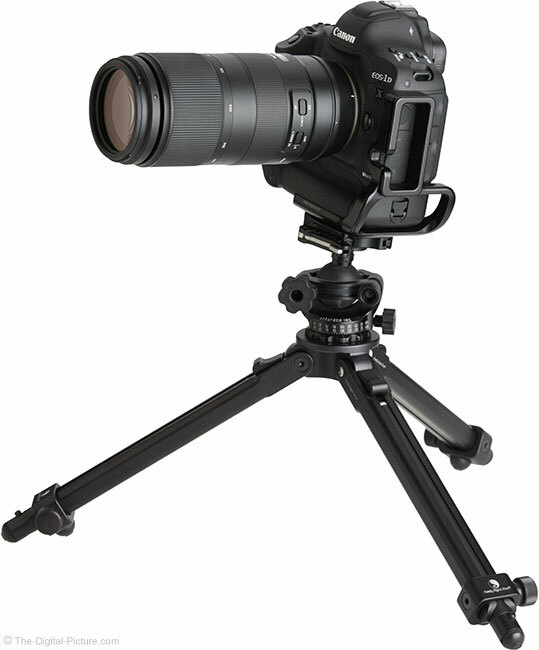 That is unless you purchase the optional (and somewhat pricey) Tamron A035TM Tripod Mount. Having a tripod ring on the lens will greatly improve the tripod-mounted experience and especially nice is that this one includes an Arca Swiss-compatible dovetail built in. Tamron lenses always include a hood and this one is no different. The Tamron HA035 lens hood is relatively large, offering significant protection from light and from impact. While the slightly-flexible design may feel less luxurious than a rigid model, the flex means that impacts are better-absorbed by the hood. The rear of the hood appears to be functional for push/pull zooming and while it can be used for such, doing so requires a firm grip on the hood for pushing and especially for pulling. Most will opt for using the zoom ring. Tamron does not include a case with this lens. Consider getting a Lowepro S&F Lens Exchange Case 200AW if a lens-only case is desired, including for storage, transport and carry. 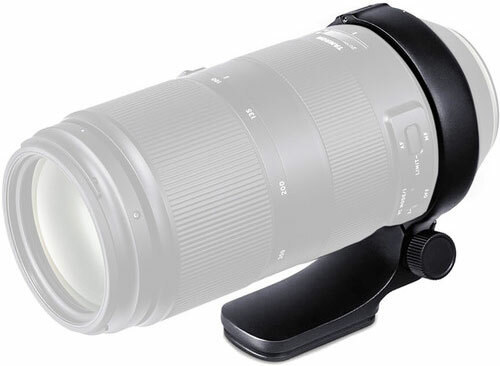 The Tamron 100-400mm f/4.5-6.3 Di VC USD Lens is compatible with the Tamron TAP-in Console. The TAP-in Console is basically a USB dock in the form of a robust lens mount cap with electrical contacts and a USB port. This enables the lens to be connected to a computer. Once the lens is attached to the dock and the dock attached to the computer, the TAP-in Utility software app communicates with the lens and checks for any available firmware updates. If an update is available, a dialog box is presented, providing the option to update the lens. There have been a number of Tamron lens firmware updates released recently, addressing compatibility and other issues. Having the TAP-in Console makes those updates very fast and easy, especially compared to the alternative of shipping a lens to a service center. 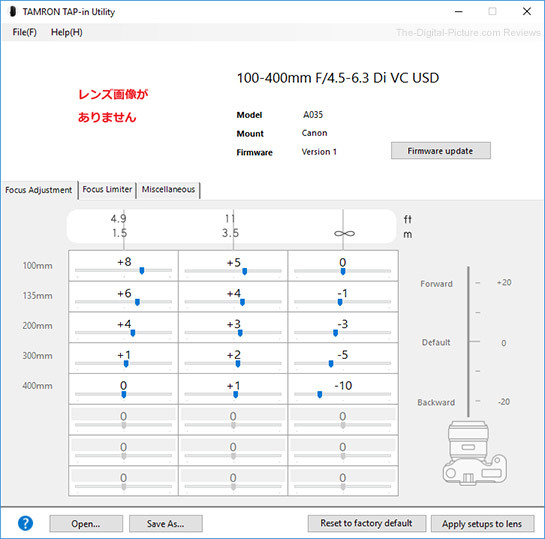 The first tab in TAP-in Utility app, Focus Adjustment, allows for autofocus calibration adjustments to be made at 5 focal lengths with 3 focus distance adjustments available at each focal length for a total of 15 adjustments available. Don't worry, the adjustment numbers in the example shown above are only for illustration purposes – I made them up. The focus Limiter tab provides the ability to customize the autofocus distance ranges for the limit switch position. The last tab, Miscellaneous, provides control over full time manual focus override and the VC mode. Note that a small image of the lens should be displayed instead of the red Japanese characters. I was using a fresh install of the latest-available version of TAP-in Utility on a new laptop. The missing image was showing later when I was testing the different VC modes. This lens is a bargain. It has a low price, good construction, useful features, very nice image quality and high utility. That combination makes it a great value. The Tamron 100-400mm f/4.5-6.3 Di VC USD Lens is available in Canon (reviewed) and Nikon mount versions. My standard disclaimer: There are potential issues with third party lenses. Since Tamron reverse engineers (vs. licenses) manufacturer electronics and algorithms, there is always the potential that a DSLR body might not support a (likely older) third party lens. Usually a lens can be made compatible by the manufacturer via a firmware update, but this cannot be guaranteed. Compatibility with the Tamron Tap-In Console is risk reducing as Tamron can make firmware updates available for download. Tamron USA provides a 6-year limited warranty (Tamron's international limited warranty is 1 year). The reviewed Tamron 100-400 VC Lens was retail/online sourced. What tripod is that? That is the awesome little Really Right Stuff TP-243 Ground-Level Tripod. 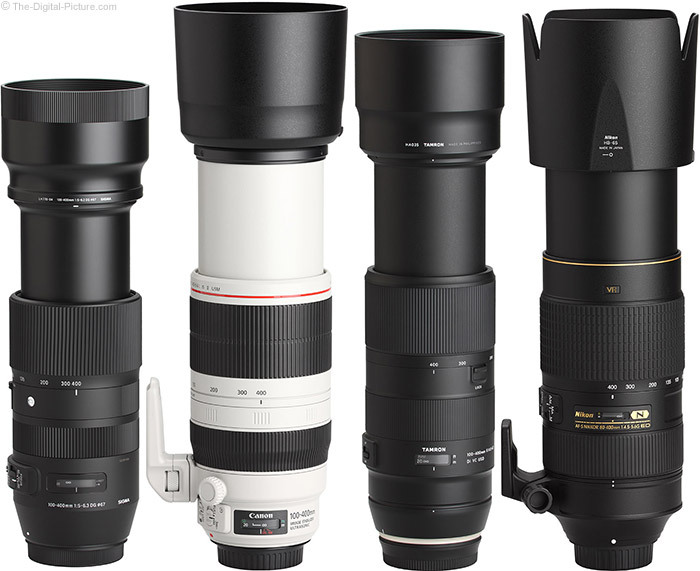 If you want a telephoto lens, there are a lot of options. If you want a 100-400mm lens, your options are far more limited. You can get the one made by your camera manufacturer – Canon, Nikon or Sony (and Sigma for a small percentage of photographers) – or get a third-party lens made by Sigma or Tamron. 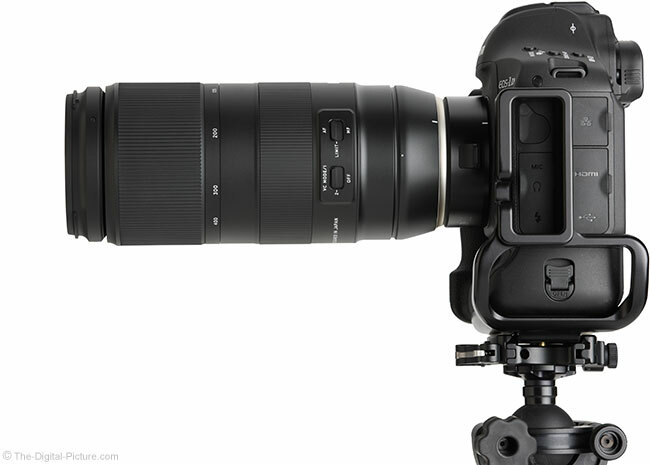 Should I get the Tamron 100-400mm f/4.5-6.3 Di VC USD Lens or the Sigma 100-400mm f/5-6.3 DG OS HSM Contemporary Lens? Sigma makes the lens that competes most closely to the Tamron and that question needs to be asked. 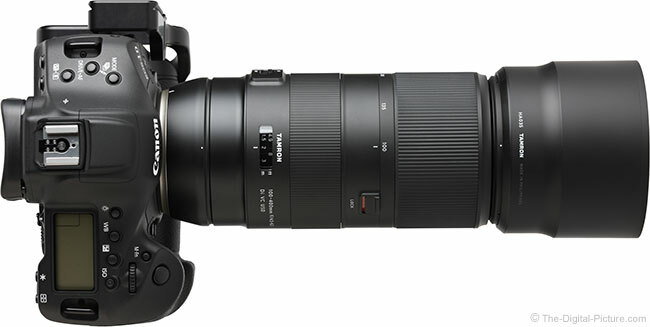 It was interesting to see Tamron announce a 100-400mm lens not terribly long after the Sigma 100-400mm introduction. The Sigma was a big hit, delivering great image quality, light weight and small size along with good build quality for an especially-popularity-driving low price and the same can now be said of the Tamron. I was very anxious to learn which of these lenses is the best and the image quality comparison is always a good place to start. But, the slight misalignment issue I mentioned earlier in the review must be factored in and with the Tamron having slightly wider apertures, it needs to be stopped down 1/3 stop in some comparisons. That said, it is hard to declare a winner between these two at any of the tested focal lengths, though the Sigma appears to have a slight advantage in the corners at 400mm and that advantage continues with teleconverters in use. Overall, sharpness is not a big differentiator between these two lenses. With 17 elements in 11 groups, the Tamron shows a very slight flare advantage over the Sigma with its 21 elements in 15 groups. The Tamron shows very slightly less distortion at 400mm. As mentioned, the Tamron has 1/3-2/3 stop wider apertures available over much of the focal length range wider than 280mm and that gives it a very slight vignetting advantage. There are of course a lot of other image quality factors, but none stick out as differentiators. The Tamron is slightly lighter and modestly longer, especially at 400mm. The Tamron has a tripod mount ring available and that can be a significant differentiator when photographing from a tripod or even a monopod. The Sigma lens provides an additional 12° of focus ring adjustment (130° vs. 142°). The differentiator between these lenses may be price, but not the street price as these lenses have are identical in that regard. Watch for rebates to become a differentiator. Remaining are the Canon, Nikon and Sony 100-400mm camera manufacturer-brand options. Since these lenses mount to only one camera brand (without an adapter at least), you can skip over your other-brand options below. 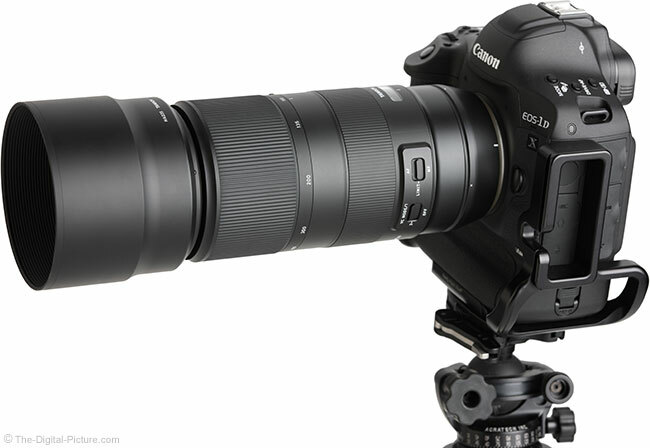 Canon owners have the very impressive Canon EF 100-400mm f/4.5-5.6L IS II USM Lens to consider. 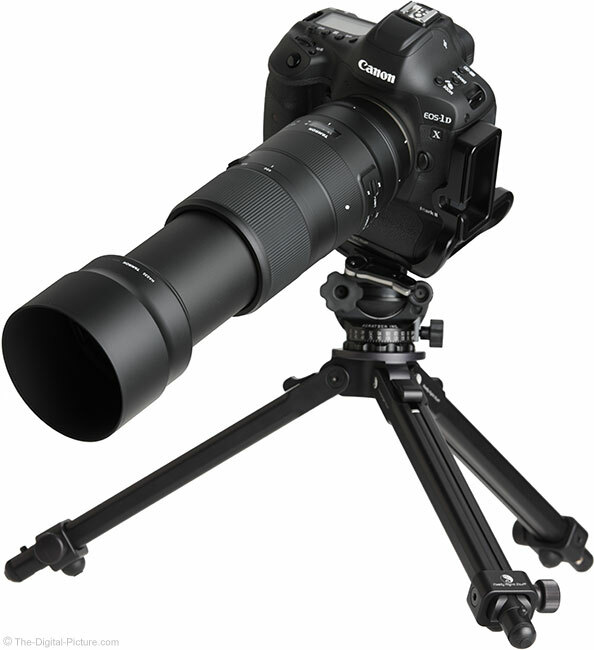 The image sharpness and overall quality of the 100-400 L II launched it to immediate success. When the Sigma 100-400 was released, I thought there was no chance that its image quality would approach that of the Canon, but ... I was wrong and very impressed. The Canon was still the better option in this regard, but ... the difference was not big and not close to the price difference. How does the Tamron compare to the Canon? With the Tamron and Sigma being so similar, the comparison should end about the same. The Canon is a bit sharper, most noticeably so at the 400mm mark and it performs better with extenders, but like the Sigma, the Tamron is much closer than its much-less-than-half price would indicate. The Canon has less vignetting, especially at the wide end, and shifts the distortion profile toward the barrel distortion side, taking on a bit of barrel distortion at 100 and giving it both a near-0 distortion setting and a touch less distortion at the longer end of the focal length range. The 17/11 elements/groups count gives the Tamron a very slight flare advantage over the Canon's 21/16 design. The Tamron is noticeably lighter, a bit narrower and slightly longer, though the Canon catches up at full extension. The Canon has a 1/3-stop wider aperture available at focal lengths above 180mm and the Canon AF system is my preference. The Canon's 232° focus ring rotation is substantially better than the Tamron's 130° and this lens has a slightly higher maximum magnification (0.31 vs. 0.28x). 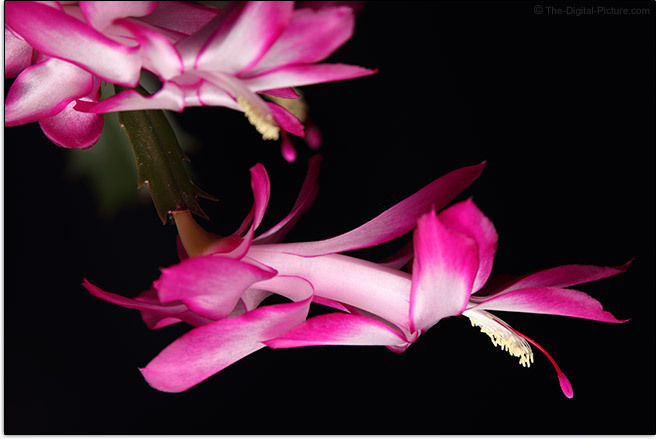 An advantage for some may be the Tamron's smaller filter size (67mm vs. 77mm). While the Canon is the better lens, the Tamron's substantially lower price, as mentioned, is going to make the decision for many. Nikon owners should opt to compare the Nikon 80-400mm f/4.5-5.6G AF-S VR Lens. In the Tamron vs. Nikon comparison, I see very similar results. The Nikon has less vignetting, but priced similarly to the Canon, costs more than twice as much as the Tamron. The Tamron is smaller and lighter, uses smaller filters (67mm vs. 77mm) and has a significantly higher maximum magnification (0.28x vs 0.20x). The Nikon has wider focal lengths and wider apertures at the long end. The Nikon's focus ring has less rotation than the Tamron (87° vs. 130°). The Tamron 100-400 VC is not (at least not initially) available in Sony mount and the need for an adapter places this lens at a disadvantage, especially from a focus performance perspective, against the native Sony option, the Sony FE 100-400mm f/4.5-5.6 GM OSS Lens. More equalizing again is the price difference, even with a high grade adapter included in the equation. Factored into Sony's favor are the Tamron vs. Sony image quality comparison results (remember that different resolution cameras are being used). The Sony has slightly less vignetting and slightly more flare with its 22/16 elements/groups count. While the Tamron has a small range of 1/3 stop max aperture advantage in the mid-range focal lengths, the Sony has the advantage from 281mm through 400mm. The Tamron is modestly lighter and narrower. The Sony's focus ring rotation is considerably longer than the Tamron's and the Sony's 0.35x maximum magnification exceeds the Tamron's 0.28x spec. 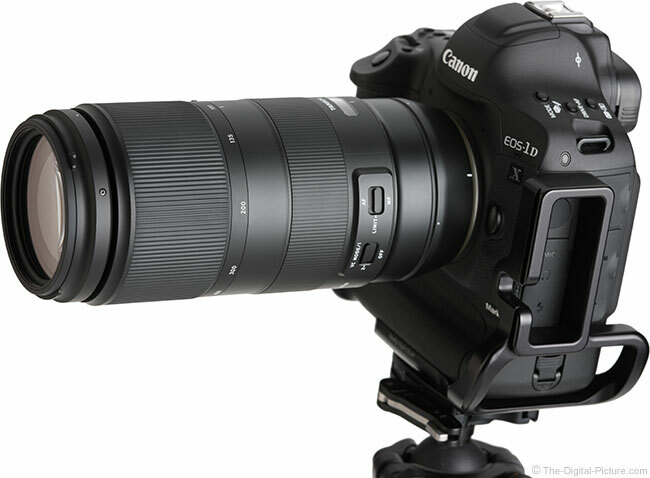 If you can drop down to 300mm on the long end, more options open up, including the Canon EF 70-300mm f/4-5.6 IS II USM Lens and Canon EF 70-300mm f/4-5.6L IS USM Lens. Many of the remaining options are the 150-600mm telephoto zooms included in the above table comparisons. While these lenses offer significantly longer focal lengths, they are much larger and heavier and are, essentially, in a different lens class. Use the site's image quality and other tools to see how the various lenses compare. The Tamron 100-400mm f/4.5-6.3 Di VC USD Lens adds a very interesting choice to the mid-to-long telephoto zoom lens options list. This lens (and its Sigma counterpart) delivers image quality close to that of the major camera brands' own offerings at a substantially lower price point. And, at a substantially lower, more-easily-portable weight. This lens does not forgo the expected quality features, including vibration compensation, fast USD autofocus and moisture-resistant construction. It looks great and the smooth design feels great in the hand. The focal length range being an extremely useful one brings great value into the equation. The Tamron 100-400mm f/4.5-6.3 Di VC USD Lens deserves consideration for a home in your kit and promises many hours of fun.